The Royal Naval Academy at Portsmouth was founded in 1733 with a comprehensive syllabus intended to offer an alternative method of training of officers for the Royal Navy (versus the established method of apprenticeship at sea). The manuscript notebook of one such student, Lieutenant Mark Whyte, dated 1752, has a frontispiece featuring an important hand-drawn plan of the Academy (what is now known as the Old Naval Academy), and the rest of the manuscript includes a multitude of ink illustrations and text that give a valuable insight into the naval training of the time. 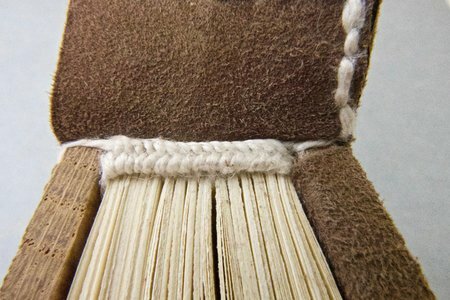 The manuscript has been rebound at least once, with signs of the text block having been washed and trimmed, and there are indications that it was bound into its current cloth case binding in the earlier part of the twentieth century. This will have been very different from its original format, but the binding is still stable for the most part. However, the mechanics around the first few sheets were problematic. 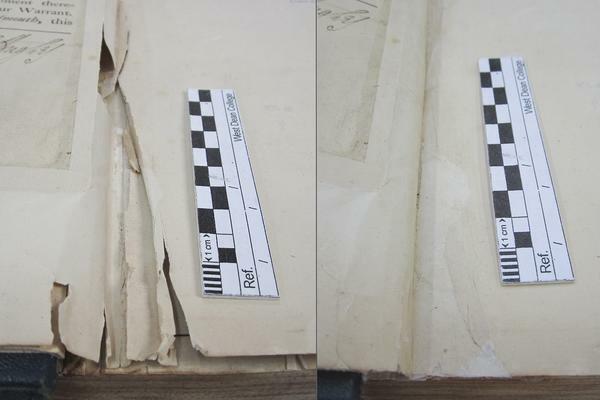 A combination of rebinding and previous repairs resulted in the first few sheets being tipped together near the joint, with the heavyweight endpapers also then being tipped onto the first sheet with what appears to have been thin animal glue. With the weight of the large text block resisting the pull of this tipping point as the front board was opened, too much strain was placed onto this area and the eventual result was that the tipping point pulled away, the sheets underneath becoming damaged in the process. The manuscript is not likely to receive heavy use in the future but will be consulted on occasion by visiting scholars and may also be used from time to time for display, when it is most likely to be opened to the frontispiece. 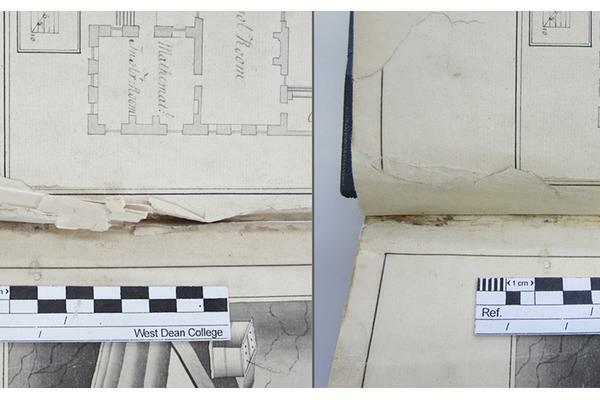 The main goals of the conservation treatment were therefore to stabilise the damaged sheets at the front of the book, allowing for safe handling and display. A number of options were reviewed, and a course of stabilising the existing material in situ decided upon. This involved extensive repairs with Japanese tissue, complicated by the presence of heavy lines of iron gall ink in the worst areas of damage. The ink had tested positive for unbound iron(II) ions. These act as catalysts of degradation, causing discolouration and decay in the paper substrate. 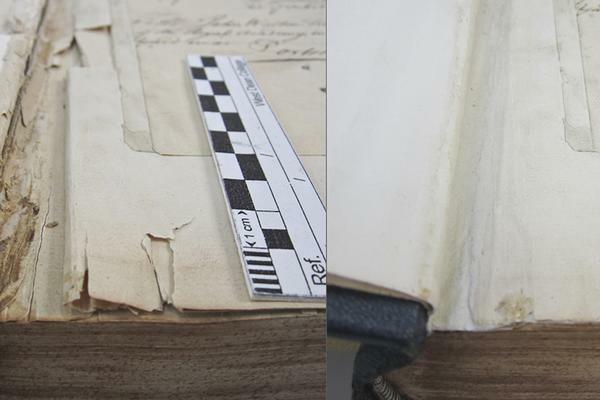 In this case, moisture from adhesives use in repairs had the potential of causing the ions to move out into areas of the paper previously not exposed to this type of damage. Therefore, whilst most repairs were made using a jin shofu wheat starch paste, a low-moisture option of 5% w/v gelatin remoistenable tissue was used where possible near the areas of iron gall ink. 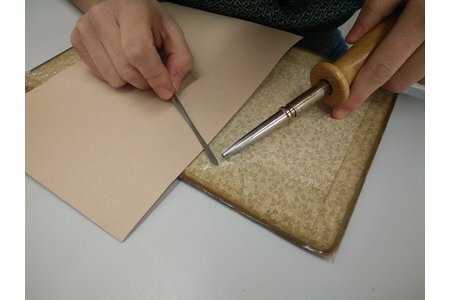 A combination of tear repairs, using varying weights of Japanese kozo tissue paper, and a 100mm long tissue hinge were use to stabilise the bottom corner of the frontispiece and reattach it into the binding. This allowed the whole sheet to move together and reduce the amount of stress points on points of weakness further up the sheet. 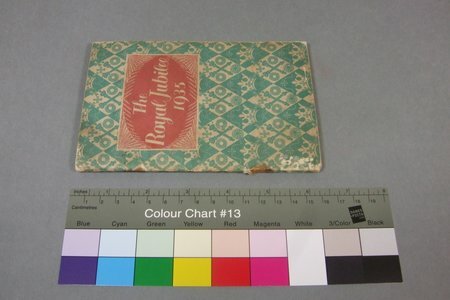 With the majority of the repairs being in the gutter area of the book, it was proving difficult to place any weight onto drying repairs safely or effectively. 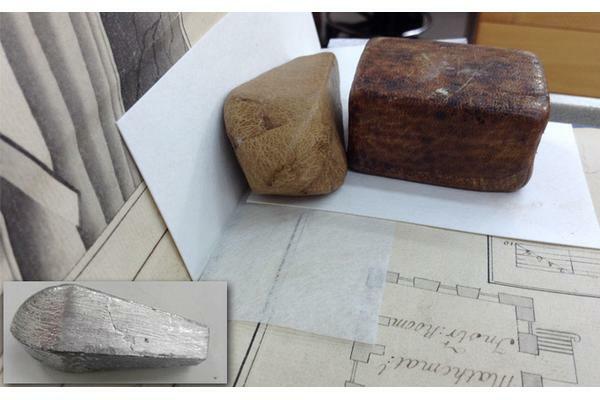 A new weight was made from a sea-fishing weight (inset) which provided the correct angles for the needs of this project. 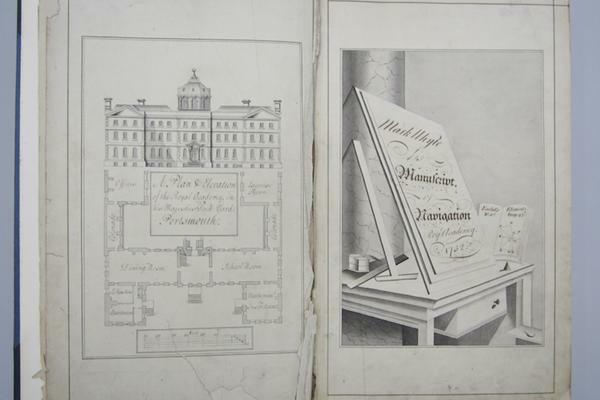 Verso of the frontispiece before and after treatment. Following stabilisation of the sheets, the front inner joint area was consolidated with a strip of medium weight Japanese gampi tissue. This was repeated at the back of the book where similar, though less severe, damage was also present. 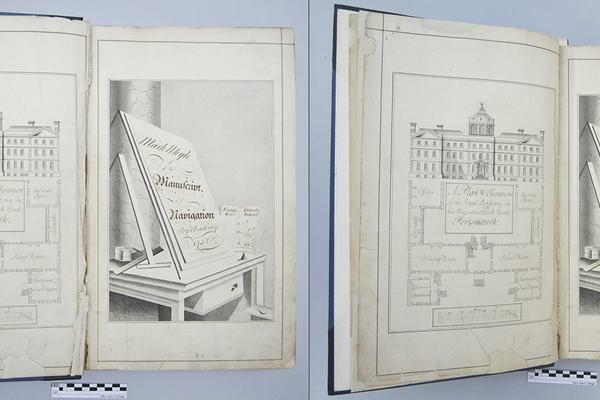 Before and after treatment photos of frontispiece and title page. The manuscript will now be returned to the Admiralty Library at Portsmouth Naval Base along with a custom-built cradle that can be used to display the manuscript open at the frontispiece page safely.